The official artwork of IXth edition GALF 2018 is exclusively designed by Viraj Naik. The artwork was unveiled at the inaugural function of GALF 2018. Viraj Vassant Naik did his BFA from Goa College of Art, Panjim and his MFA at Sarojini Naidu School of Fine Art, Golden Threshold, Hyderabad. He has been guest faculty at the Sarojini Naidu School in 2002; and Artist-in-Residence, Frans Masereel Centrum, Belgium in 2012. He lives and practices from his studio 'Graphikos' Kesarval, Quellossim, Goa. 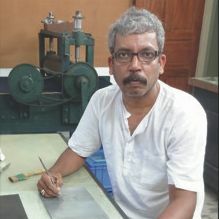 Viraj has been the curator/co-curator of 'Look at this Land' Etching Portfolio Workshop, Sunaparanta-Goa Centre for the Arts (2012); 'International Artist Workshop-Goa' in association with Tellus Art, Sweden (2013); 'Goa is not a small place', Kalakriti art Gallery, Hyderabad (2015); and 'Mini Print Goa 2015' in association with the Directorate of Art and Culture, Goa (2015). His solo shows include 'Ambrosia de Fabulae', The Art Walkway, Park Hyatt, Hyderabad (2017); 'Hybridization', India Fine Art, Mumbai (2013); 'Seize on', Apparao Galleries, Chennai (2010); 'Fanatical Beings', India Fine Art, Mumbai (2009); 'Mythical Menagerie', Visual Arts Centre, Hong Kong (2008); 'Speaking of otherness', Pundole Art Gallery, Mumbai (2007); 'Landscape with Possible Monsters', Travancore Palace, New Delhi (2006); 'Blue Ants', Lalit Kala Akademi, New Delhi (2006); 'Anxiety', Museum Gallery, Mumbai (2004); and 'Metamorphosis', Galeria Cidade de Goa, Goa (2003). He has participated in various national and international graphic art biennials, triennials and exhibitions in Abu Dhabi, Australia, Bangladesh, Belgium, Bulgaria, Canada, Egypt, Italy, Japan, Macedonia, Mexico, Portugal, Serbia, Switzerland, Taiwan, Thailand, the UK, Ukraine, the US and elsewhere. Viraj has won several scholarships and awards such as Goa State Art Awards (1997 & 2000); Hyderabad Art Society-Gold Medal (2000); Nokia Arts Award-Asia Pacific (2000); S. L. Parasher Gold Medal-Central University of Hyderabad (2000); Young Artist Scholarship, Ministry of Culture, Government of India (2001); Yuva kala srujan puraskar, Ministry of Art & Culture, Goa (2008); International Biennial of Mini Prints, Tetovo, Republic of Macedonia (2008); and Junior Fellowship (Graphics), Ministry of Culture, Government of India (2011). 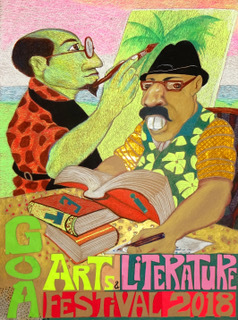 "Goa is the land of beautiful nature, expressions are its key attraction to the arts and literature. Though geographically the land is small, its people has wings to their ideas, where imagination gives characters its personal stories that makes them colourful, crafty etc..."
Medium: Mix medium and stencil cut. Size : 102cm x 82cm.